In a food processor, combine cannellini beans, olive oil, 3 tablespoons fresh lemon juice (about 1 lemon); season with coarse salt and ground pepper. Puree until smooth. Place puree in a serving bowl, and lightly sprinkle chili powder over the top, if desired. 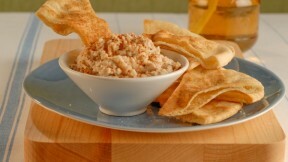 Serve dip with toasted pita chips.